Happy Hump Day! 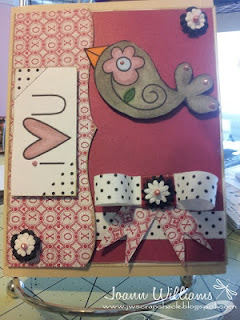 Today I decided to whip up a card for Kim over at Paper Smooches. They are having a Guest Designer call for the month of December. If you think you would like to give this a go you still have plenty of time. The deadline is November 21st. Click HERE to read more about it. I decided to use Paper Smooches "I love you" sentiment along with their adorable bird! I really love this bird lol. I colored in the bird with my copics YR02, YR04, B41, W3, W5, YG67,RV93 and RV95. The heart was also colored in using RV93 & RV95. My card is a regular 4 1/4 x 5 1/2 base. My card base is paper by Recollections and the pretty pink and patterned papers are from Little Yellow Bicycle's "Love Letters" collection. I have had this paper stashed for a very long time and I finally found a good use for it. The patterned paper has a hint of gray outlining the circles so that is why I went with a gray bird. I added some black/white washi tape to the corners of the sentiment and added a few black/white prima flowers. 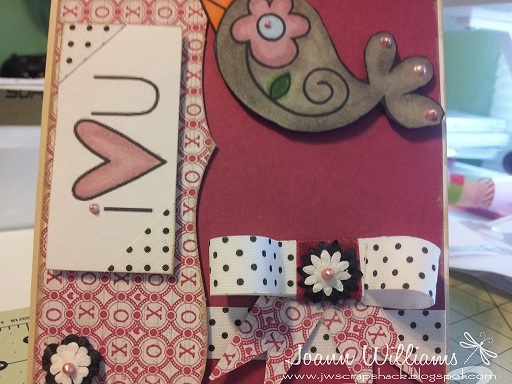 To the flowers, bird and the "i", I added some Petal Pink liquid pearls. The bow believe it or not is made from washi tape and the ribbon ends are some of the patterned paper that I cut by hand. 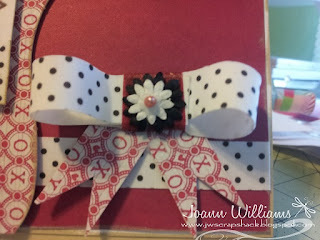 Below is a close up of the "washi-tape" bow. Sorry that the picture is a bit blurry, my lighting was off. Well thats it for today my friends. I sure hope you stop on over at Paper Smooches and enter your own project. You cannot be chosen if you do not try out! And have you seen all the new stamps being showcased yet? The snowmen are too cute! I just LOVE Kim's stamps! Thanks for stopping by ya'll!